The latest news and notices for Waituna can be found below. 2018 05 03 Duck hunters advised to take care at Waituna. 2018 04 20 Toxic algae still present in Waituna Lagoon. 2018 03 29 Toxic algae found in Waituna Lagoon. Frequently asked questions about toxic algae can be found here. 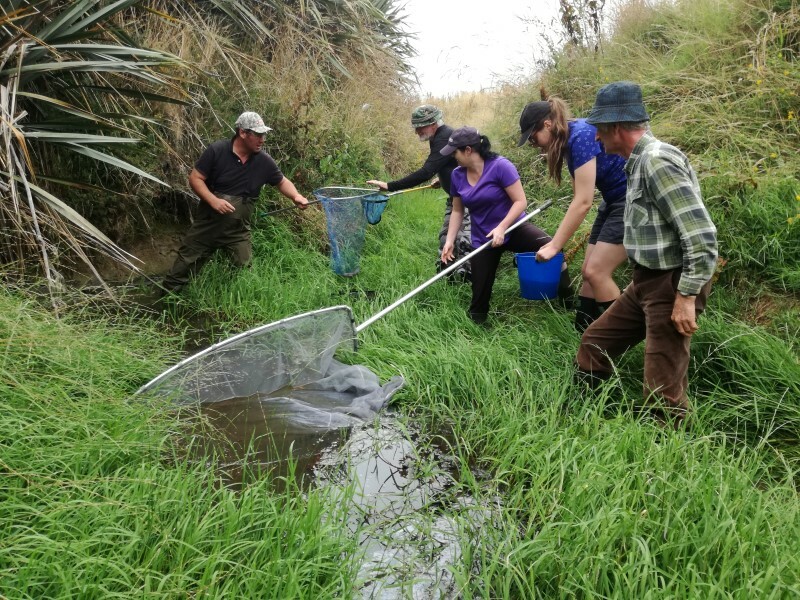 2018 01 27 Fish relocation Waituna Creek. Photo by Michael Killick. On Saturday 27 January a small group of volunteers met at the Waituna Creek to rescue a number of Giant Kokopu who had found themselves struggling with the low water levels. Earlier in the week, Environment Southland Catchment Works Inspector Craig King had found several dead and dying kokopu in the creek, and after contacting the Department of Conservation he organised the fish rescue operation. About 36 kokopu and inanga were caught and moved further down the catchment, although equally as many dead fish were spotted. On Monday 29 January the Department relocated another 16 kokopu, 15 inanga and a koura on Moffat Creek; however an eel that was spotted wasn’t keen to be moved. Department of Conservation Senior Ranger Jane Bowen said native species were struggling with the current low levels in waterways across Southland. "It's been pretty grim going down there and everything is dried up, it's pretty much just ponds in front of the culverts that still have water in them," she said. Fish trapped in ponds are also suffering. "You get these small pools and they heat up really badly because they are shallow and the sun is beating down. When you have so many fish in the pool you get greatly reduced oxygen, and it is very distressing to see them in these conditions, gasping at the surface for oxygen, rotting." If you know of any places where the fish are struggling to survive, please contact Jane Bowen, Department of Conservation Senior Ranger for Awarua Waituna on 027 204 2310.